No steel beach this weekend. Timing activities on the ship can be tricky. If you schedule something like a steel beach picnic every weekend, Sailors lose their enthusiasm and can even start to look at it as an entitlement. 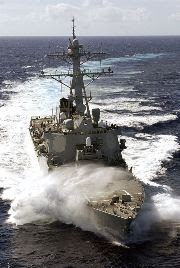 On the other hand, if MWR activities get spaced too far apart, the deckplates will start to grumble. 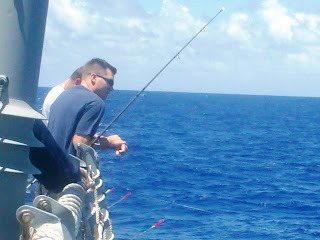 So, this weekend we chose to schedule some fishing and golfing from the flight deck. They dilligently trailed their lures for three hours, but not a single strike. It's also best to schedule as many of these activities now, while we're transiting, because when we get to our final destination the pace of operations may not allow it. I've seen that done before on ships. It's probably worth suggesting to the MWR Committee to see if there's crew interest. We did trap shooting on the Antietam, way back when i was active duty. Lots of fun. 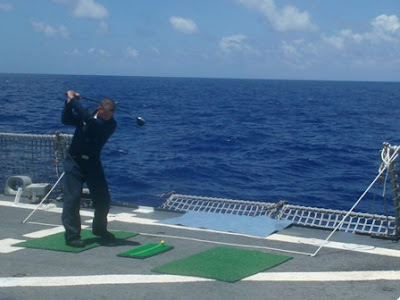 LOL, looks like your short game is bound to suffer after a long enough cruise, but you'll have the drives nailed!